We tried a new restaurant this weekend and we like it! 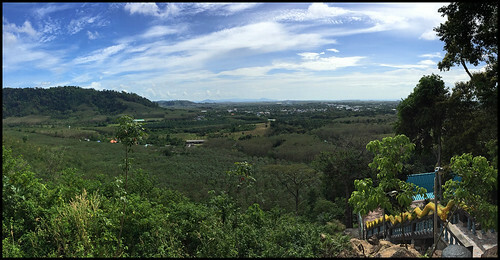 Nern Khao View Talay (เนินเขา วิวทะเล), which means something like "on a hill with a seaview" is located just north of Kok Kloi Town in Phang Nga province, only about 10 kilometers from the Sarasin bridge that connects Phuket to the mainland. Actually we did stop at this restaurant one time before, just for a drink, and decided it was worth another look. 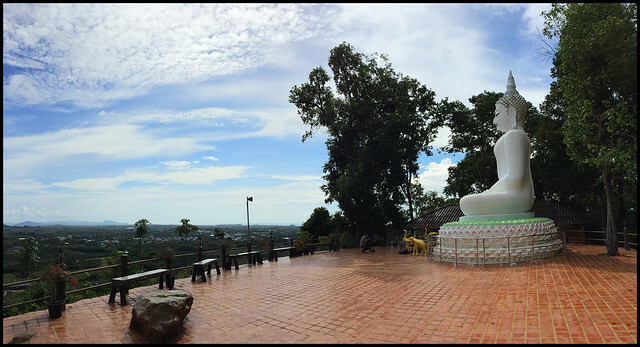 Nern Khao View Talay is on a small hill very close to Wat Khao Waterfall, which we visited earlier in 2016. A pretty little waterfall, and there is another restaurant right there at the falls too. 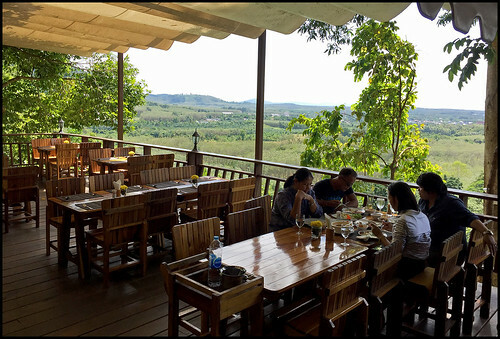 At first we thought Nern Khao View Talay looked a bit fancy and expensive, but a quick look at the menu showed that actually the prices are very good. So, it was on the list for a proper visit! 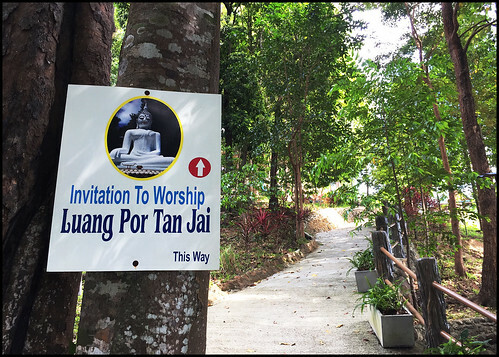 Only takes about 1 hour from our house to reach Kok Kloi (we are in Kathu, near Phuket Town). 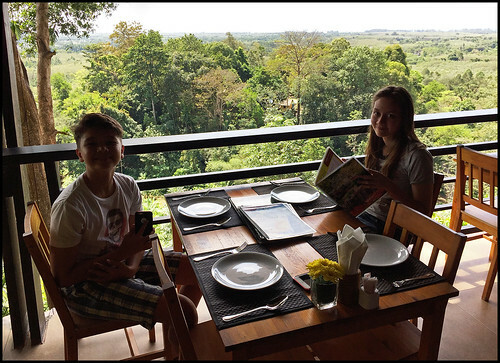 The restaurant was not busy when we arrived, so we got a prime table with the best view. I mean, it's not a spectacular view, there are no big mountains here, but you can see for miles and you can see the sea (which is about 4km to the west). The turn off the main road is not that easy to see, just a small sign that says "Wat Khao Waterfall", and the restaurant is up a steep hill. There's parking for about a dozen cars. 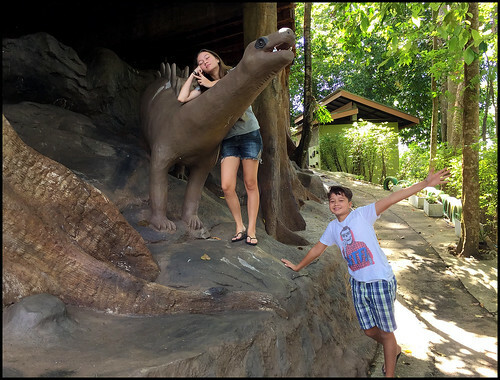 And then a path which for some reason features dinosaurs! 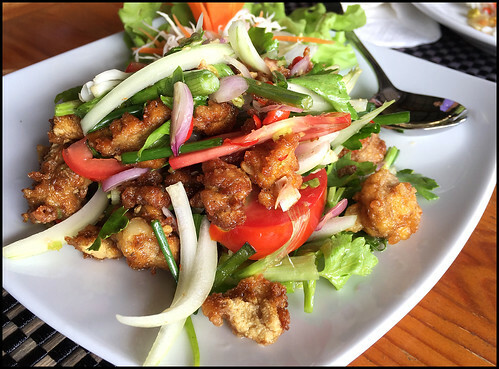 The menu is extensive, lots of local food, seafood, lots of Thai salads (my favourite! 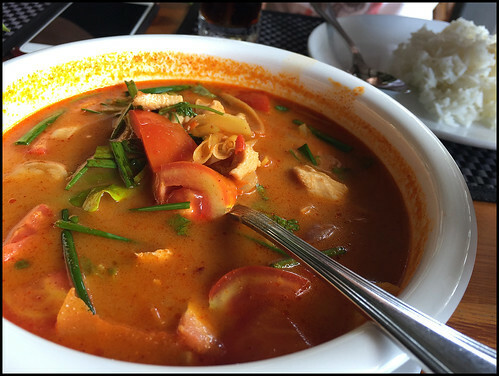 ), and simple rice and noodle dishes, tom yum and plenty more. Prices decent - tom yum was 150, fried rice 60 Baht, salads around 150 Baht and rather pleasingly a Chang beer only 60 Baht. We ordered what we thought would be maybe a bit too much, but I get carried away with big menus sometimes! After a while I realised we only had 1000 Baht with us, and we wondered if we'd ordered more than that! (above) Yam Tuna Fu ... mango salad with fried crispy tuna (I mean, like deep fried until crispy and crunchy). Normally made with catfish (Pla Duk). It's great. 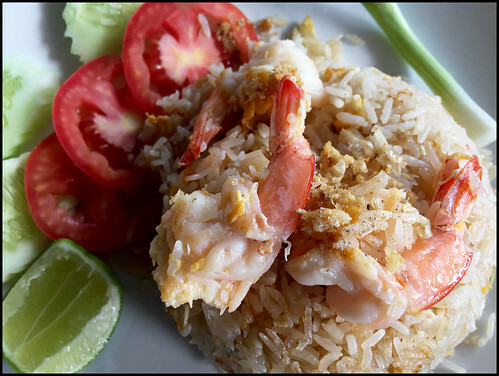 (above) Simple fried rice with prawns. I had this rather than just plain steamed rice. 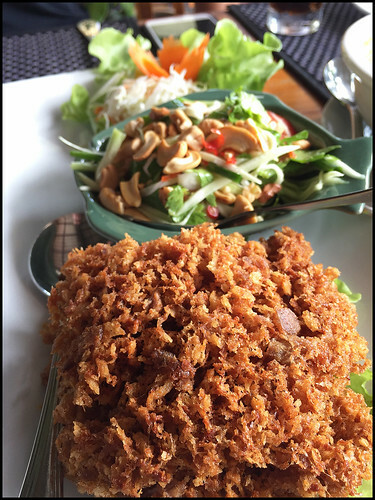 (above) Yam Kai Pla - spicy salad made with fish eggs. Super tasty. And there was also a stuffed omelette (kai yat sai). It was all good! We're likely to go again soon, maybe for an early dinner, as the sunset would be good from there - looking out to the west towards the sea. Sitting there with a full belly, I felt very happy to have found another little gem of a restaurant. 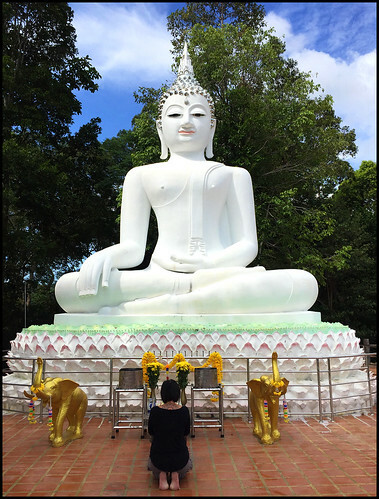 The manager suggested we walk further up the hill to a Buddha statue, so we did. And my dear wife said a little prayer before we descended to the restaurant to get the bill ... only 890 Baht for 4 of us with all that food. The restaurant had filled up a bit by the time we left. I recommend this place, or the Krua Klang Dong restaurant next to the Waterfall, though that one is a bit more basic. Kok Kloi has another popular restaurant called Poo Dam (Black Crab) which people tell us has great food, but it's by the road and I do like a view! 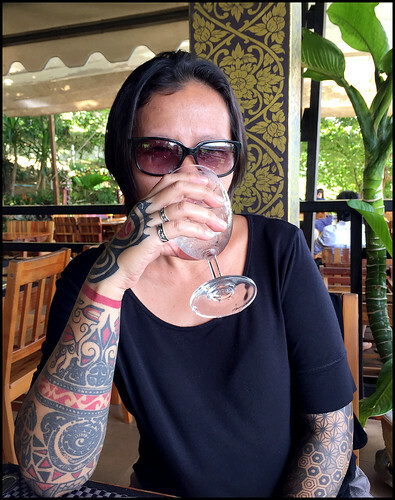 I am sure we'll be back at Nern Khao View Talay again sometime soon.